Large grocery shop, greengrocer, and butcher on London Road. It occupies three shopfronts, though the one on the left is not connected to the other two internally. 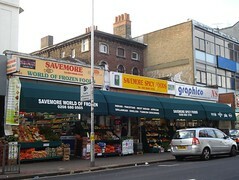 As of December 2011, the frontage advertises "Indian, Pakistani, West Indian, African, Sri Lankan, English, Turkish groceries". The single-unit (left side) of the shop has a butcher's counter and various frozen foods, as well as a somewhat disorganised miscellany of homewares including sink plugs and such. The other side has flours, beans, lentils, spices, instant noodles, spice pastes, and so on. Samosas (meat and veg) are available from behind the counter. There's a vegetable display outside on the pavement, including more unusual things like tinda and baby aubergines. Last edited 2018-12-19 11:04:15 (version 36; diff). List all versions. Page last edited 2018-12-19 11:04:15 (version 36).